Are you a LGBT Business Enterprise or thinking about certification? Are you interested in winning FREE registration and travel to the NGLCC International & Business Leadership Conference in Tampa from August 13-16th. Join us for this day of education, and the chance to create a 30-second video pitch about your business. All videos will be voted on by the community, with the finalists getting a chance to showcase their Capability Presentation on May 14th, for a chance to win the prize. There will be two winners. Attendance is open to any interested business. 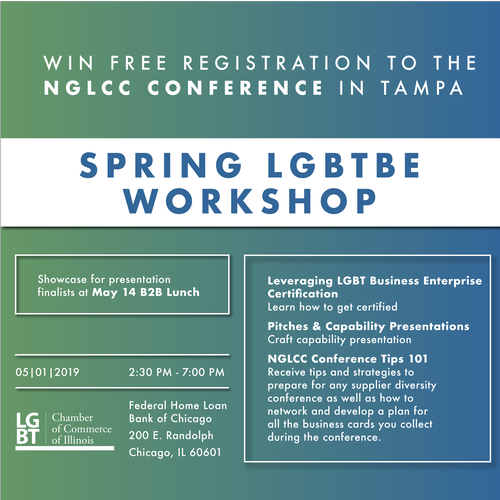 Each business interested in competing must be a Chamber member, certified LGBT Business Enterprise, or should have created their profile on the NGLCC website by May 1. All information will be verified by NGLCC. The certification fee of $400 is waived for Chamber members. Learn about the process to get certified, and ways to leverage the certification locally and nationally. Participats will craft their thirty-second pitch, and will learn how to present their capability presentation. You will walk away from this session with the tips and strategies to prepare for any supplier diversity conference, as well as how to network and work the conference floor. In addition, you will develop a game plan for all the business cards you collect during the conference. May 1, 2:30 - 7pm. The program will end at 6pm, but guests will have the option to record their videos between 6 -7pm.